I work in an open plan office at Inventium, the innovation consultancy I head up. Our Melbourne office consists of two long custom-made wooden desks, on which staff cluster around with their MacBooks. Natural light streams in from our four-metre-high windows, plants hang from the ceiling, and patches of graffiti coat the walls. Which is all good in theory, except for when you actually want to work? I am writing this article from my home office because I find it almost impossible to do deep, focused work from my “real” office. When I try to do this kind of work in the actual office, I am constantly interrupted and my time becomes reactive – reacting to other people’s questions, needs, and requests. When sitting across the desk from my teammates, it’s almost hard not to fall into a pattern of constant interruption. As a general rule, architects and bosses alike salivate over open plan offices – they look so hip and creative. And if your company is a fast growth tech start-up then an open plan office is par for the course. Aspirational images of table tennis tables used as desks, colourful fitballs posing as chairs, and weird things hanging from the ceilings fill the mind when we think about an open plan. But open-plan offices are not all fun and games. Indeed, research has shown that there is a dark side to the open plan office. Counterintuitively, face-to-face interactions actually decrease in open plan offices. Researchers from Harvard University and Harvard Business School tracked the communication of 52 employees at a Fortune 500 company. When participants shifted from a cubicle environment to an open plan office, employees spent 73% less time interacting with their workmates face-to-face. Meanwhile, their use of email to communicate with co-workers jumped up by 67%. These results are surprising, considering that one of the so-called benefits of an open plan is increased collaboration. One of the reasons driving the decrease in face-to-face communication in an open plan environment is the lack of privacy. The majority of people don’t want to have entire conversations overheard, so it becomes easier to resort to email or instant messenger. It turns out that employees are generally less satisfied in open plan offices, despite the fact they are often talked about as being a more appealing alternative to cubicles or offices. Research published in the Journal of Environmental Psychology found that the negative aspects of open plan, including lack of privacy and disruptive noise levels, outweighed benefits such as ease of interaction. Professor Ann Richardson and her colleagues from New Zealand conducted a review of all research published between 2000 and 2017 into open plan environments. They found that open plan offices actually have negative health effects on workers. 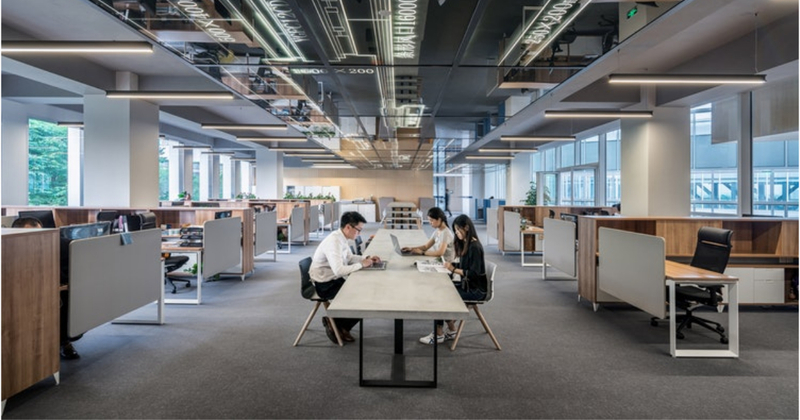 Compared to individual offices, those in open plan took more sick leave and were less satisfied with their jobs, in addition to being less productive at work. When I made the decision to house Inventium in an open plan environment several years ago, I had no idea that the research was so against this type of workspace. And now, because of space constraints, it is difficult to reverse this decision. So, in the absence of an office redesign, the solution to overcoming this decision has been having a very flexible work policy. At Inventium, staff can work from wherever and whenever they like. I personally am almost never in the office before lunchtime, preferring to spend my mornings doing deep, focused work at home or in a quiet café – anywhere where I can control the level of interruptions facing me. My teammates mostly spend 1-3 days working from home every week, which means when we are in the office, it is a fairly quiet place despite being open plan. If you are about to embark on an office redesign, resist trying to replicate the uber cool image of the classic open plan design and consider bringing back the cubicles. Your staff will thank you for it.